All busy moms know that sometimes snacks on the go can get… well… boring! Throwing bite size bits in a ziplock bag doesn’t exactly scream “Well-thought out, healthy, considerate snack with love from Mom!” Now, obviously we gotta do what we gotta do and many times that is gonna include some pretzel sticks or goldfish crackers or whatever is left in the pantry stuffed in a bag tossed to the kids as they are walking out the door and we will chalk that up as a WIN. Buuuuuuut for those occasions that we want to spend just a tad more time and send a special message, we can whip up a caramel apple basket – easy peasy! 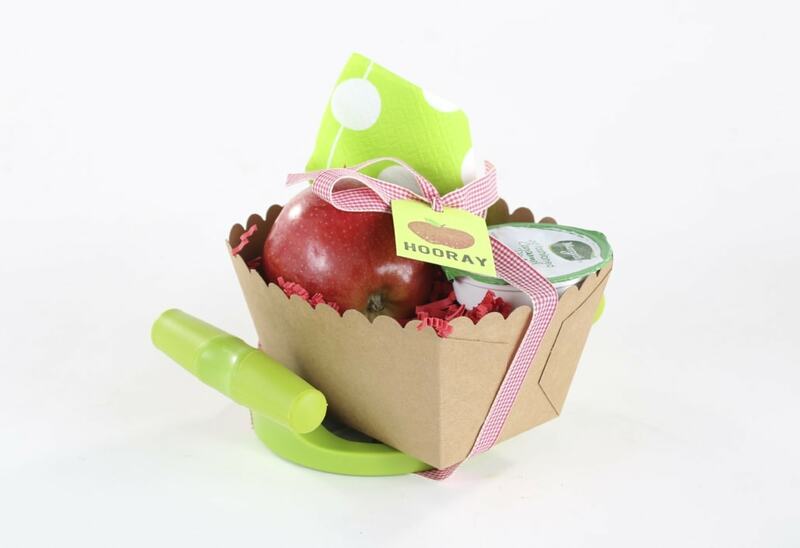 Toss an apple and an individual caramel pack into a scalloped basket by Fun Stampers Journey, top it off with a cute napkin and a nice note and Voila! Whether they are on their way to the big game, their final recital of the season, acapella auditions, or little league tryouts, any event is better with a special snack and mini message from Mom! Looking for more ideas for eats on the go? Are you ready to wow the family by taking the ordinary into extraordinary? To be intentional about celebrating and building family memories? To create a home where life is always a party? If you answered HECK YES! Then this is your opportunity to do just that….